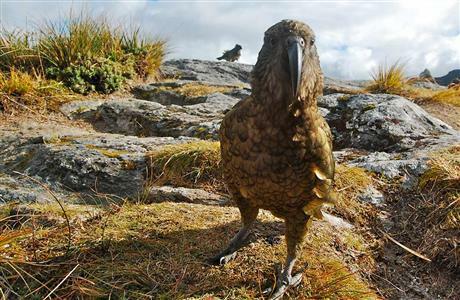 A cheeky committee of keas woke us early on Day Three. They perched on the outdoor tables, eying us as we emerged to go to the toilet. We had been warned to hang up our boots and take all our belongings inside or these mischievous birds could demolish them. Their human-like expressions were slightly disconcerting. Still stiff from the previous day, some of us hobbling, we packed up our things and headed off in dribs and drabs. It was clear the weather was going to be kind on this important day. The view beckoned. A short, forgiving preamble through the forest, and then the mountain started to demand more. Switchback after rocky switchback pulled me closer and closer to the sky. Granite peaks opened up in spectacular fashion around me as I climbed out of the forest’s embrace. The uphill leg was easier than I had anticipated, and after two hours I reached the Mackinnon memorial with plenty of energy left. I would need it later. I pulled off my pack, dug out my gloves, jacket and hat—it was cold—and walked to the edge overlooking the Arthur Valley. 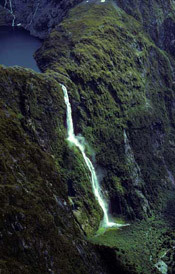 Tomorrow we would follow it to Milford Sound. Just across from me was another mountain top, a snowy plain near the peak seeming almost close enough to touch. Next to me, Spain and Romania were kissing. (As you’ll know if you read Chapter Two, by now I was referring to my fellow hikers by their country of origin.) I edged away, hitched on my pack and continued to the shelter, about 20 minutes away along the ridge of the pass. The wind was fierce now, whipping my raincoat and biting my fingers. The shelter had two doors: Guided Walkers and Independent Walkers. I stared wistfully at the first, imagining unlikely luxuries involving spa pools and hot soup and Benedict Cumberbatch, and opened the second. It was windless, at least. We sat and shared a Kendal Mint Cake and talked about Hilary and Mount Everest. Then I went for a pee. 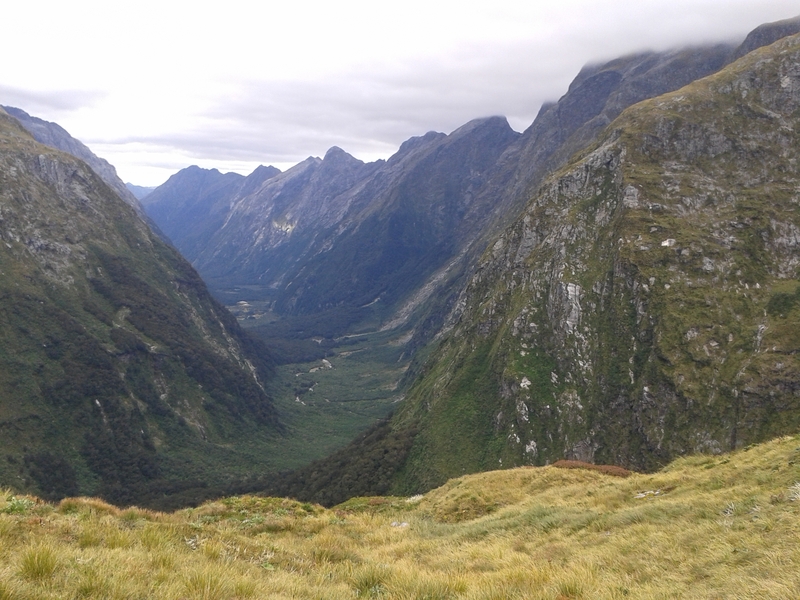 The toilet at the top of the Mackinnon Pass faces out across the Clinton Valley, which we had hiked over the previous two days. They say it is the loo with the best view in the world, but at risk of oversharing, I would have weed down my leg if I had tried to see it mid-flow, because the window is set a little too high in the door. I was too self-conscious to leave the door open. I imagined Spain wandering over as I sat: Just a-looking at the view. Don’t a-mind me. Olé! I emerged and stared and stared and stared. I almost couldn’t take the view in; it was too impressive and huge and gorgeous and all those superlatives they use in the brochures. But I was aware of the time and the downhill leg ahead of me. I left Chicago cooking their instant noodles in the shelter and headed off. This was the part of walk I had been worried about. I find going downhill much more difficult than going uphill. I feel vulnerable to trips and falls, as if I am not planted firmly on the earth. What I recall of the next few hours is this: rocks. Then more rocks. Then some boulders, then more rocks. This wasn’t just “going downhill”. It was “picking your way downhill over cruelly jagged, uneven terrain, carefully judging each move and risking ankle breakage with every step”. It was tough. I couldn’t imagine how hikers could do it in the rain and snow, as my partner had done many years before. The saving grace of the descent was Roaring Burn, the stream that pours down the valley, and the steep staircases that hug the side of its wild, thrashing tumble. It was spectacular, the rushing cascades spearing into emerald pools, then gathering momentum to pitch themselves over the next rocky threshold, down and down in thundering sheets. I had a pounding headache and my feet and shins were killing me. A late lunch helped, and then we pushed on to Quintin Hut, the Fikers’ (Fake Hikers; see Chapter One) accommodation for the final night on the track. 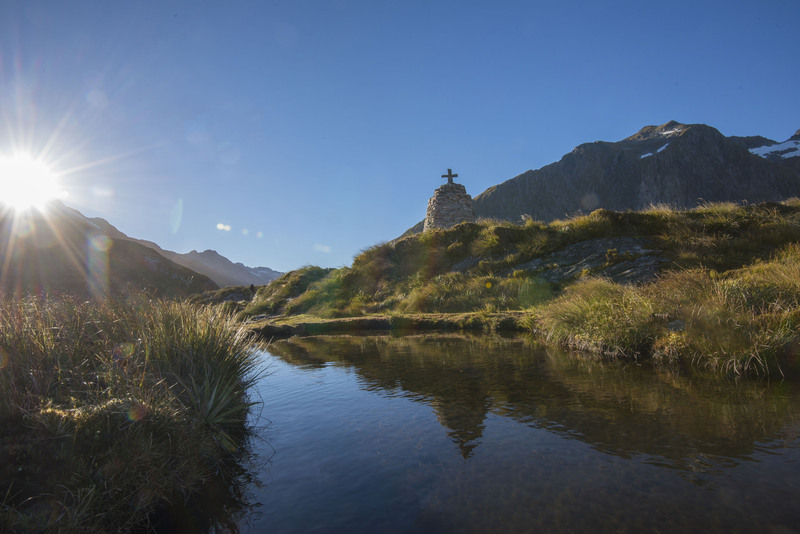 Our own hut was only an hour away, but we had been urged to dump our packs at Quinton and take a side track to the Sutherland Falls, the tallest waterfall in New Zealand. I very nearly didn’t; I was almost at the end of my tether. But I pushed on, knowing I may never be back here again. It was worth it, especially when Darth Vader stripped off and tried to take a shower under the falls. The crashing spears of water were too powerful, so he dived into the waterhole below instead. The last hour to Dumpling Hut was a breathless, painful, sweaty trudge. I was at my limit, my feet on fire, one toe numb. How intrepid, I thought. The nail will fall off, just like Cheryl Strayed’s in Wild. Excellent. (As I write a fortnight later it’s still hanging on, but only just.) I stumbled into camp and dumped my pack on the bed Hot Bird had saved for me. He grinned. I scowled back, in no mood for celebrating. He, Darth Vader and Mountain Goat were already heading out the door. On a crazy, what-the-hell whim, I followed them. At the water’s edge we all stripped down to our underwear (or further, in the case of the boys), and without hesitation hurled ourselves into the icy water. The air in my lungs whooshed out of me in an incredulous wollop. We screamed and hollered and swore. Loudly. Apparently they could hear the screams from the hut. Two seconds later, panting on the shore, I felt liberated and ever so slightly insane. “Again!” I screamed, and off we went, long enough this time to scrub under our arms for a nanosecond. But that’s all it took. I felt unbelievably gorgeous, fresh and new and awake. That resonated with me. For so long, I thought, I have chosen the easy option; the normal; the path with least risk, least exposure, least discomfort. I have forgotten what it is to be wild and joyous. To be me, stripped bare (literally). I felt 20 again. Back at the hut, my eight hours of walking fell away from me, and our last night around the table was a happy, loud affair. The Israeli woman came over and asked if she could pull up a chair. We made room and welcomed her in, although we were all a little taken aback. Up until now she had shown no interest whatsoever in our company. She started to talk. Her mother had died on this day four years ago. She and her husband had held a little remembrance ceremony at the Sutherland Falls that day. Her mother had walked the track twenty years ago, so this trip was a kind of pilgrimage for her. As she talked in her beautiful, halting English, quietness settled around the table. It was very moving. I wondered if her aloofness had simply been her need to hold herself apart in preparation for this day. Now the day was nearly over, perhaps she felt able to be with others again. I sensed that everyone at the table was wondering why on earth they hadn’t spoken more to this woman over the last couple of days. She had so eloquently summed up our experience; what we all felt but were unable, or perhaps unwilling, to express ourselves. “What is your name?” asked Mountain Goat softly. The Israeli choked and rasped and clicked her way through a couple of syllables. We stared.